Imagine a time when the United States was still largely untamed, primitive wilderness. You can capture that experience at a spot just twenty minutes southeast of Columbia, South Carolina. Congaree National Park, with more than 26,000 acres of near-virgin forest, is a portal to the past, to a time when millions of acres of old-growth bottomland hardwood forests towered along the banks of southeastern rivers. Rich in both natural and cultural heritage, Congaree offers a glimpse of what surrounding lands in the southeast once looked like. The signs of man’s influence on this wild place, from Native Americans to loggers, are still very evident today. Of the millions of forested acres, much like those you’ll find at Congaree, most have disappeared, fallen victim to intense logging. Congaree’s ancient trees were able to survive due to the park’s remote nature, but not without help. By the 1960’s, logging continued to threaten this forest of immense old-growth cypress, tupelo, laurel oak, and loblolly pine. Led by men such as Harry Hampton, local conservationists lobbied Congress and other politicians to protect Congaree as a national park. 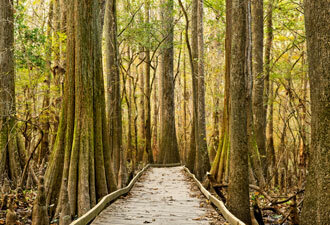 Their passion led to the establishment of Congaree Swamp National Monument in 1976. Re-designated in 2003, Congaree National Park protects an active floodplain ecosystem and preserves a large area of federally designated wilderness close to a major city. Wilderness activities such as hiking, canoeing and camping allow visitors to experience the park up close. 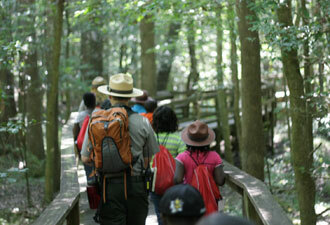 Hiking trails provide access for visitors to explore the Congaree wilderness. Walking through the stands of old-growth trees, you can observe wildlife such as red-shouldered hawks, wild turkeys, and white-tail deer. 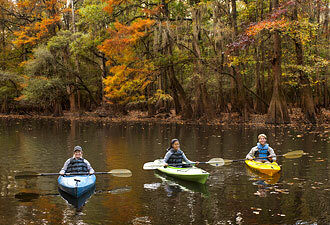 Canoe and kayak routes along Cedar Creek take visitors through a tunnel of green leaves in the spring and summer. Whether you plan your own trip or take part in a ranger-guided tour, keep your eyes open–there’s good chance that you’ll see river otter, heron, or maybe even an alligator. Campgrounds provide space for visitors to pitch a tent and spend a night under the stars. For the more adventurous, backcountry camping is an option. The boardwalk trail	from the visitor center makes the floodplain accessible to all visitors and shares the big picture in a small frame. The 2.4 mile boardwalk leads visitors through the forest toward Weston Lake, a former bend in the Congaree River that was cut off and left behind as an oxbow lake. Yearly floods may cover the trails and parts of the boardwalk, bringing in necessary nutrients that help create the thick green canopy high overhead during the summer. These yearly floods are part of what makes this forest one of the tallest deciduous forests in the United States. Whether you’re seeking solitude, spiritual connections, wildlife viewing, or recreation, Congaree has an abundance of ways to get closer to nature.